Got some challenging pediatric patients on your caseload? Never fear! We have your back! If you know your kiddo likes being silly and has a wiggly body, it’s inevitable - it will happen whether you like it or not. Keep control and stay in charge by building in silly time. Play the “Hokey Pokey,” which incorporates music, gross motor movements, motor planning, listening and following directions, and shaking out your body one limb at a time! The science behind it: If your kiddo likes to move, their body may need need that extra sensory input to help them understand where in space they are. If they’re being silly and you ask them to stop, you may be fighting a losing battle if they’re acting on a basic bodily need. Therefore, by building in that “silly time” for them to get out their wiggles, they’re getting the input they need/want/are seeking and you maintain control over your session. Try this: Make it big! How can you show your kiddo the exercises you want them to perform if they won’t look at you? If their eyes are wandering throughout the whole environment, try expanding your desired exercises to fill more of the environmental space you have available! Trampoline jumps, jumping around the gym, large-scale hopscotch. Something to catch their attention in a bigger way and to expand the space you’re using so their attention doesn’t have to be focused in such a small, narrow space. Why this works: You’re meeting the kiddo where they’re at. In OT, we call this the "just right challenge." This means that if your kiddo’s attention is wide and unfocused on your immediate visual area, then asking them to perform a task right there in that tiny little zoomed-in space may be unrealistic in terms of success. Instead of just asking them to balance on a wobble board while squatting, try making the exercise part of a bigger picture, like part of a relay or a simple scavenger hunt. Consider a Simon-Says type game where they run and find an item, balance on one foot, and toss it back to you. Bigger movements and more environmental usage is easier for their brains to handle than working in a tiny little area. Try this: Get ahead of the game. Standing on a balance board to rescue and toss stuffed animals to safety, to toss froggies in a pond, throwing the fish back into the sea, etc. Walking across a balance beam without falling in the hot lava! Walking the plank and jumping in the ocean...you get the idea! Making this a success: Our kiddos are smart. When they know something is difficult for them, they suddenly become the best task avoider you ever did see. Hence the hilarity they find in falling to the floor every time you count backwards from 5 when balancing on one foot. Try This: Add some proprioceptive input! Instead of just working on push ups, try varying the routine and the exercises you use. Wheelbarrow walks are a fun way to increase upper body strength, as well as increasing attention, alertness, coordination, visual motor integration, sensory needs, and so much more! Wall clap push-ups are a favorite of mine because even if your kiddo is being silly and not executing this task with ideal form, they can still get so much out of the exercise! Great for upper body strength, visual motor, hand strength, motor planning, bilateral coordination, incorporating fun, and building rapport. Animal walks are a fun, easy, creative way to get your kiddo in different positions (think bear walks for shoulder girdle stability, crab walks for trunk/core strength, snake slithers to promote army crawling). You can find or make some cards with pictures from which they can choose, place animal pictures throughout an obstacle course, or put animal pictures on a large die (dice) and have your kiddo roll to make a selection. Bonus: try these with a partner for some peer-based interventions! Here’s why this works: Exercises that serve to increase upper body strength often overlap with exercises used to increase proprioceptive input. Problem #5: They are all over the place without a sense of personal space! This tip is basically the opposite of what we discussed in Problem #2 where we broadened the space and tried to fill it. Here, you can use the following suggestions to help narrow the space for your kiddo who has a difficult time seeing a table as something to avoid or not bump into. Turn your gym into a place that needs a treasure map to navigate! This helps because there may be a difficulty with spatial awareness and/or body awareness. 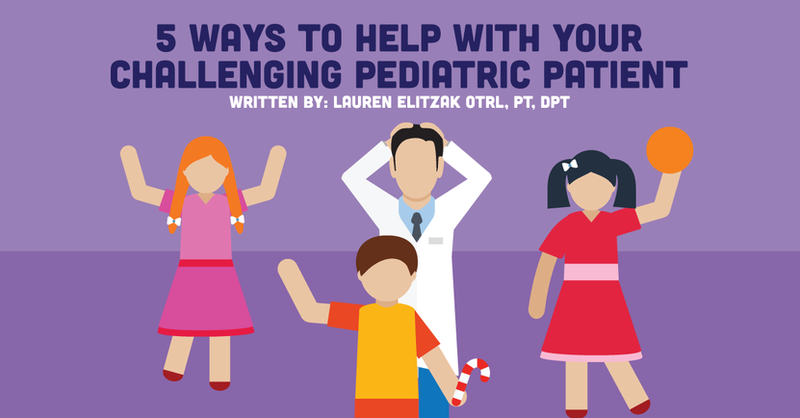 Challenging pediatric patients are going to pop up in every PT's life. Giving the child a little more structure by following a schedule allows them to better understand the boundaries of your expectations during the session.